Lynch Mobs Killed Latinos Across the West. The Fight to Remember These Atrocities is Just Starting. Alamo Drafthouse Announces Teacher Appreciation Wednesdays! Enjoy Free Movies on Wednesdays--Just Bring Your Teacher I.D! President Donald Trump wants to add solar panels to his long-promised southern border wall — a plan he says would help pay for the wall’s construction and add to its aesthetic appeal. Humanities teach students to think. Where would we be without them? Following announced funding cuts in US universities, is it entirely paranoid to wonder if humanities are under attack because they enable students to think? When Boston public schools introduced a new standard map of the world this week, some young students’ felt their jaws drop. In an instant, their view of the world had changed. The USA was small. Europe too had suddenly shrunk. Africa and South America appeared narrower but also much larger than usual. And what had happened to Alaska? Author Pat Mora has been named the winner of the Texas Institute of Letters’ prestigious Lon Tinkle Award for Lifetime Achievement. Author Pat Mora has been named the winner of the Texas Institute of Letters’ prestigious Lon Tinkle Award for Lifetime Achievement. This is the highest honor given by the TIL, which was established in 1936 to recognize distinctive literary achievement. The award will be presented to Mora at the TIL’s annual banquet, set for April 8, 2017 in El Paso. Mora will receive the Lon Tinkle Award for Lifetime Achievement at the Texas Institute of Letters' awards banquet in El Paso. El Paso native and award-winning author Pat Mora is among a dozen of recipients of this year's literary awards by the Texas Institute of Letters, which will meet in El Paso in April for the first time. Mora will receive the Lon Tinkle Award for Lifetime Achievement at the institute's awards banquet on April 8 in El Paso. The award is the highest honor given by the Texas Institute of Letters, a nonprofit honor society established in 1936 to recognize distinctive literary achievement. Arts and humanities educators are calling for renewed support for their fields following reports that President Donald Trump's administration is considering scrapping the National Endowment for the Arts and the National Endowment for the Humanities—a move that advocates say would be both a practical and symbolic loss for education. A summer institute for school teachers will be made possible through a $130,000 grant from the National Endowment for the Humanities (NEH). The institute is sponsored by UTEP’s Department of English, Department of History, Center for Inter-American and Border Studies, and Institute of Oral History. A total of 25 Summer Scholars who teach grades 6-12 will be selected from across the country to convene at UTEP to participate in the institute in July 2017. Each teacher will receive a stipend of $2,100 for the two-week program. 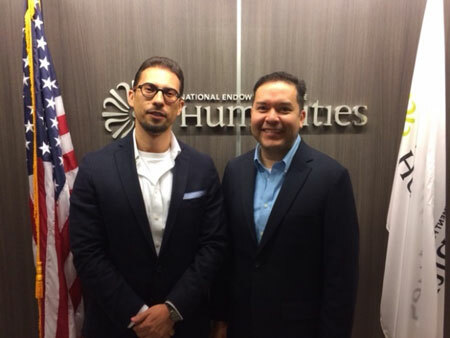 The institute directors are R. Joseph Rodríguez, Ph.D., with UTEP’s Department of English and Ignacio Martínez, Ph.D., with the Department of History. “The NEH Institute is an effort to reframe our national discourse about the ways in which we see and talk about the U.S.–México borderlands and its binational populations,” Martínez said. Leading experts and award-winning scholars will contribute to the institute. In conjunction with inquiry-based activities centered in the classroom, Summer Scholars will also take part in several pre-planned field trips to local archives and repositories, historical sites and cultural venues. Summer Scholars will prepare interdisciplinary instructional e-portfolios to incorporate into the secondary-level classroom with their students. Overall, the goal is to advance the critical study of borderlands histories and narratives and to benefit teaching and scholarship in the humanities. “We believe it is important, especially for young adults, to understand and recognize the role that these marginal spaces and its populations have played in U.S. history and literature,” Rodríguez said. Award-winning poet Pat Mora joins us for the first installment of our “Sabiduria: Poetry Edition” or words of wisdom by poets. These conversations with poets are part of a collaboration with the online arts magazine Culture Strike. Pat Mora talks to us about how she missed the sound of Spanish as she moved to different places across the country. You can also hear her reading three of her poems.